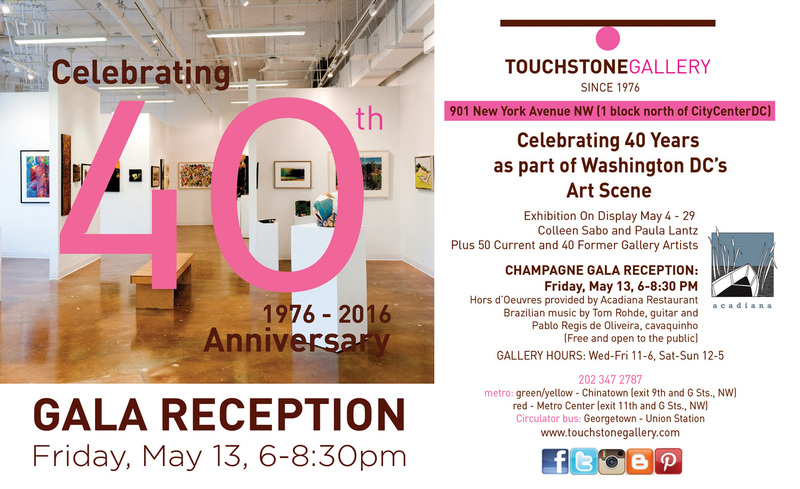 Touchstone Gallery celebrates 40 years! 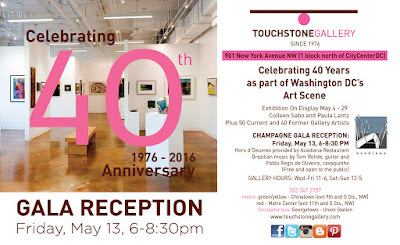 Congrats to Touchstone Gallery! In gallery years, 40 is like 200 years for most other businesses! 40th Anniversary Show including artwork by 50 current and 40 former gallery artists. Exhibiting Artists: Lina Alattar, Steve Alderton, David Alfuth, Linda Bankerd, Ann Barbieri, David Beers, Harmon Biddle, Jo Ann Block, Jill E. Brantley, Richard Braswell, Dana Brotman, Chica Brunsvold, Roberto Carvalho, Danny Conant, Marcia Coppel, Tory Cowles, Charlie Dale, Lionel Daniels, Mari DeMaris, Anthony Dortch, Susan De Serio Faden, Susan Feller, Connie Fleres, Elaine Florimonte, Michelle Frazier, Pamela Frederick, Jeanne Garant, Judith Giuliani, Robert Goebel, M. Alexander Gray, Marco Gutierrez Zevallos, Patricia Helsing, Angela Herbert Hodges, Carolyn Johnson, Timothy Johnson, Leslie A. Johnston, Peter Karp, Aleksandra Katargina, Nihal Kececi, Makda Kibour, Ai-Wen Wu Kratz, Chee-Keong Kung, Harvey Kupferberg, Michael Lang, Paula Lantz, Cathy Leaycraft, Carl Lennartson, Francine Livaditis, Teresa RobertsLogan, Carol Lopatin, Marge Loudon Moody, Shelley Lowenstein, Rosemary Luckett, Mary H. Lynch, Kate McConnell, Pete McCutchen, JoAnn McInnis, McCain McMurray, Newton S. More, Bill Mould, Georgia Nassikas, Minna Nathanson, Aina Nergaard-Nammack, Leslie M. Nolan, Nancy Novick, Mary D. Ott , Mark Palmer, Cheryl Parsons, Wendy Plotkin-Mates, Lauren Rader, BD Richardson, Ron Riley, April Rimpo, Michelle Rogers, Colleen Sabo, Amy Sabrin, Claudia Samper, Rhona LK Schonwald, Rima Schulkind, Janathel Shaw, Connie Slack, Janos Somogyi, Maureen M. Squires, Tre, Mary Trent Scott, Lisa Tureson, Rosa Vera, Gail Vogels, Gale Wallar, Jonathan Wassom, Ellyn Weiss, Janet Wheeler, Melissa Widerkehr, Patricia Williams. Paula Lantz presents part of an on-going theme of boldly painted and collaged abstracted figures. This show will feature all new work completed within the past two years in oils. Included will be landscapes, city scenes, florals and still lifes, with an emphasis on French landscapes.